Physarum polycephalum. Photo by Phil Ross. The peculiar sensibility this comic describes is not the sole province of scientists. 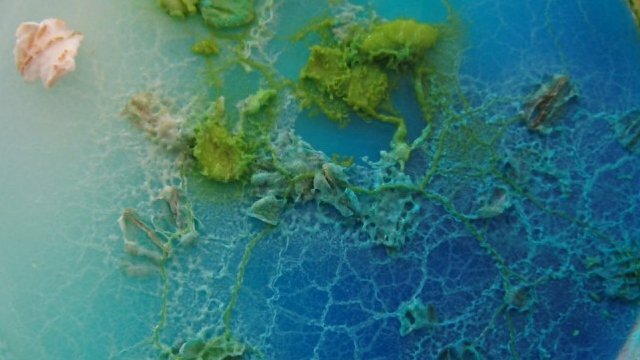 Meet artist Phil Ross and his slime molds. Ross’s film Leviathans is on display at the Vast and Undetectable exhibit in the San Francisco Arts Commission Gallery. The gallery isn’t large–you can see it all in half an hour–but it’s fun. “Fungi,” I answered without thinking, because hey, they’re mold, right? Wrong! Slime molds are not true molds, and therefore not fungi, although scientists once thought they were. In fact, slime molds are close cousins to amoebas. P. polycephalum is also the poster child for plasmodial slime molds. An individual slime mold of a plasmodial species is just one enormous cell with a whole lot of nuclei jostling around inside–which is hard to believe when you see the creature’s complex network of veins. Human veins are made of many cells. So how can you build veins inside a single cell? The slime mold constructs its veins out of proteins called actin and myosin and fills them with cytosol (basic cell fluid). By rhythmically pumping cytosol through its veins in one direction, the slime mold can expand and move toward food, a more pleasant environment, or anything else that strikes its fancy. This kind of movement is called cytoplasmic shuttle streaming, and a bit of Google Scholar searching will inform you that scientists are not totally sure how it works. But the mysteries of their movement and their fondness for breakfast cereal aren’t the only tricks up the slime molds’ veins. They can plan cities! Grow bio-computers! Re-define intelligence! Or at least they might be able to inform human efforts in these directions. Who knows what will come of it all? One thing’s for sure–slime molds will always be beautiful. Hat tip to Symbiartic for linking Vast and Undetectable! Danna Staaf is a marine biologist, science writer, novelist, artist, and educator. She holds a PhD in Squid Babies from Stanford and a BA in Biology from the College of Creative Studies at the University of California, Santa Barbara. She helped found the outreach program Squids4Kids, illustrated The Game of Science, and blogs at Science 2.0. She lives in San Jose with her husband, daughter, and cats.